One great resource for the history of the Annual Conference, and particularly for African American churches, is the book Passionate Journey: History of the 1866 South Carolina Annual Conference. This book, by the Rev. John W. Curry, a long-time member of the 1866 Conference, tells the story of the founding of that Conference in the aftermath of the Civil War and emancipation, but it also talks about how it grew and evolved into a strong force. The book does not dwell in the far past, but does discuss the conference’s early leadership and its challenges. Some of its initial leaders were white northern clergy who came to South Carolina to help re-establish the Methodist Episcopal Church in the state. Within a few years, most of these clergy gave way to native-born African American leaders, though the conference had white presiding elders as late as 1884. The first African American bishop to preside over the 1866 Conference was R. E. Jones in 1926. After the 1939 reunification of Methodism and the creation of the segregated Central Jurisdiction, all of the Conference’s bishops were African-American until the last quadrennium before merger. Those early leaders worked under difficult circumstances, as white Carolinians were resistant to the changes taking place around them. The Rev. B. F. Randolph was assassinated in October 1869. Rev. Thomas Wright of York was attacked in his home. Rev. J. R. Rosemond was unable to serve many of his rural Spartanburg congregations during 1870 and 1871. Importantly for local churches that are seeking information about their early history, the book provides brief sketches of many early clergy leaders in the conference. These clergy were often instrumental in founding or leading some of the older churches in the conference. The book also contains sketches of some of the earliest congregations, including Centenary, Wesley, and Old Bethel in Charleston, Trinity Orangeburg and Trinity Camden, Cumberland in Florence, John Wesley in Greenville, Wesley in Columbia, Silver Hill in Spartanburg, Thompson Centennial in Anderson, and Emmanuel in Sumter. The work of women’s organizations in the Conference makes up one chapter, with a focus on the various missionary outreach activities. Plans in the 1890s for an orphanage did not materialize, though education remained an important focus. Missionaries to Africa were sent in 1906 and 1907, and the Home Missionary Society was organized in 1910. As early as 1920, lay women were elected to represent the Conference at General Conference. During the 1920s, one woman, Rev. Minnie Berry, was licensed as a local pastor and later ordained deacon. Rev. Curry’s book has good information about the 1866 Conference’s role in the modern Civil Rights Movement in South Carolina. In particular, Rev. Curry focused on the role played in Orangeburg by Trinity Church and the ways in which members of the congregation supported the movement. The book also focuses on material that will be helpful to historians today as we work on remembering the 50th anniversary of the merger of the two conferences into the present South Carolina Annual Conference. 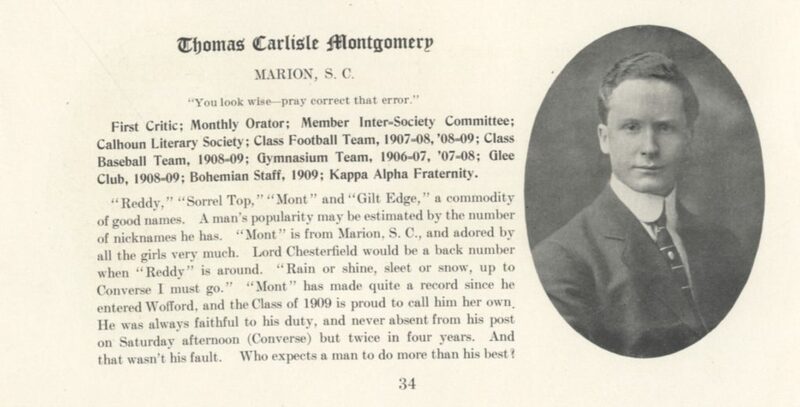 South Carolina’s Methodists were well aware of world affairs a hundred years ago this month. 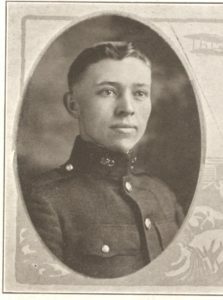 With American entry into World War I, one Advocate columnist predicted that American entry would tip the balance in favour of the Allies. Another South Carolina missionary in Brazil wrote about his work there. And Methodists celebrated their community at the annual Indian Fields camp meeting. 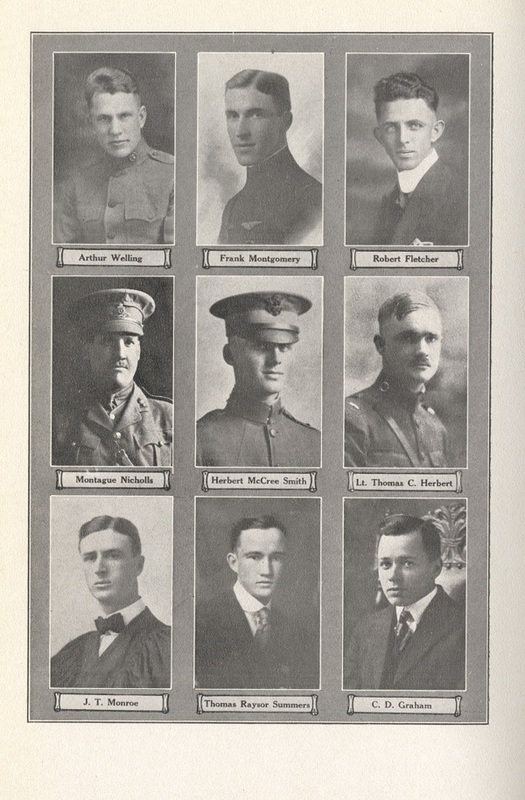 Here are some of the stories from the Advocate of October 1917. Dr. David Duncan Wallace writes: The longer the war goes on the more evident it becomes that those German authorities were correct who had preached before the outbreak of the conflict that Germany’s hope for victory in the war would be in an overwhelming assault at the front. When this plan failed because of the unexpected resisting power of France and the invaluable aid rendered by the small British contingent that did not know how to be defeated, the German hope of victory was really scuttled. The British drive now on in Flanders is accompanied by a barrage fire beyond anything in intensity, constancy and effectiveness that either side has ever seen. If Russia had stood firm, the end of the war would have been immensely hastened. With the advent of great American armies next summer, the end it is all together reasonable to anticipate will be brought about inside of that year. 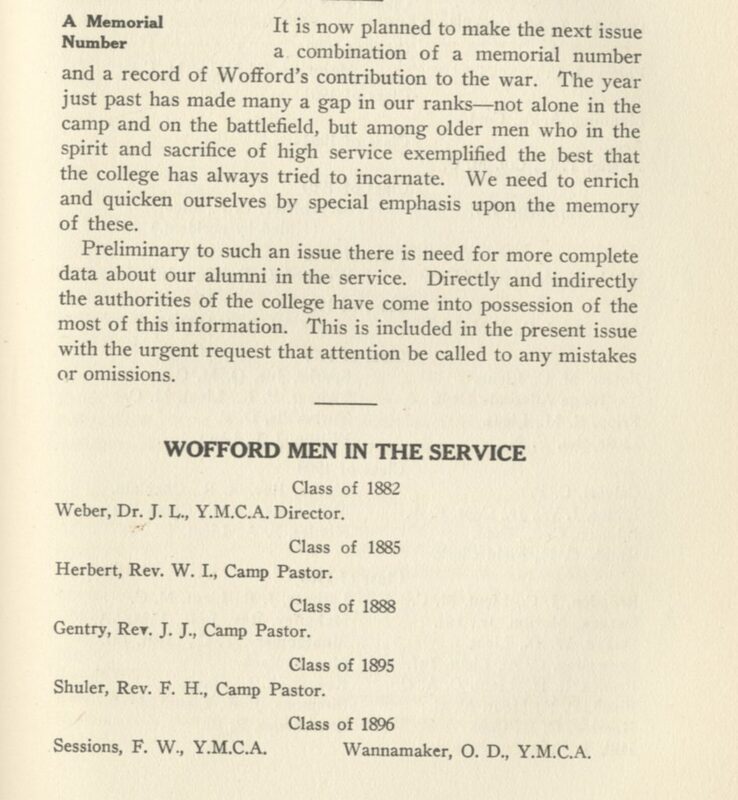 My dear Dr. Stackhouse: we were delighted to get your letter written just after the Wofford commencement. A few days ago I returned from our annual conference in Rio de Janeiro. Bishop Mouzon is not with us. However we had a splendid conference. The reports of both native and missionaries are the finest in all the history of our Brazilian work. Even though the times have been hard on account of the war, yet our financial reports were excellent. Our Sunday school gain was more than three times the gain of 1915-1916. Our Epworth league also made a forward step. In fact, all of our work was greatly advance during the year. I believe it all points toward a great of a day for Brazil. Those of us who are here are glad that we have a part in this change for the better. My territory is all new. So many times do I preach to people who have never before heard the Gospel. Next Sunday I shall receive into the church a man who had never attended a Protestant service until he moved here some months ago. Finally, this report summarized the annual camp meeting at Indian Fields, which is still going strong a century later. Indian Fields camp meeting closed Sunday which was the biggest day of the camp and a number of people from Charleston drove up in machines [automobiles] to spend the day. From Summerville to the camp there was a continuous stream of vehicles from the high powered motor car to the old farm wagon pulled by a mule. The camp meeting is held every year and is one of several held in the state, the next one being in about three weeks time at Cypress. The roads to the camp were in good condition, this being another attraction for a Sunday afternoon drive, and machines were in evidence from every part of the state. A number of machines were advertising the Orangeburg County fair, showing that Orangeburg was well represented. The campgrounds are situated on a beautiful site about 3 miles from St. George, well shaded by large pine trees. The tabernacle is in the center of a large tract of land, full of stately pines and surrounded by a number of small houses called tents by the campers. 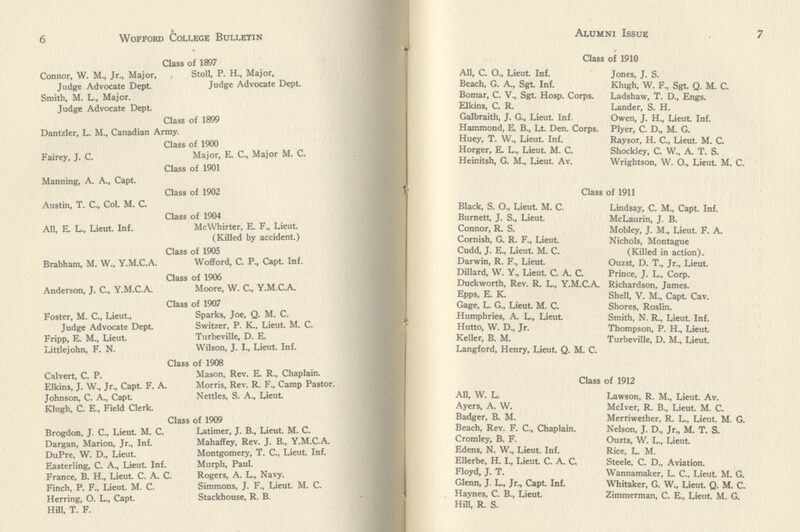 One of Wofford’s 1918 graduates, Gerald D. Sanders had written regularly for the Journal while a student. Shortly before his graduation, he found himself on the way to France as a member of the Allied Expeditionary Forces. 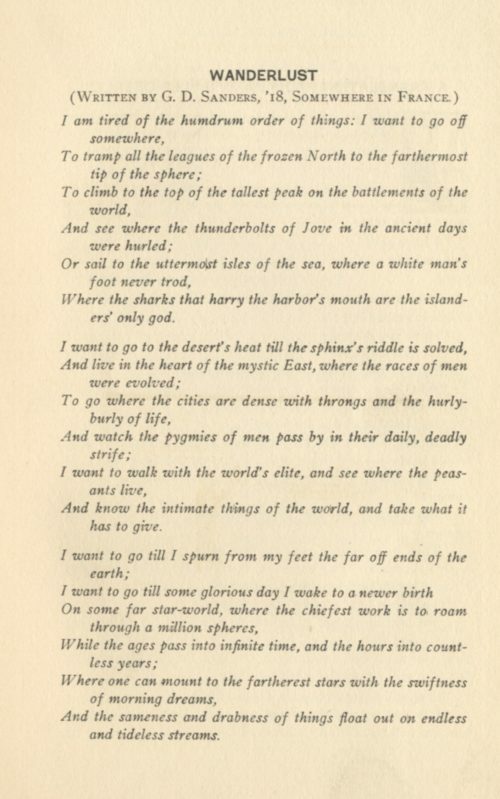 He wrote several poems while overseas, and they wound up being published in the Journal the next year. Sanders later earned his PhD in English and taught at Michigan State Normal College, Cornell, and the University of Arizona. 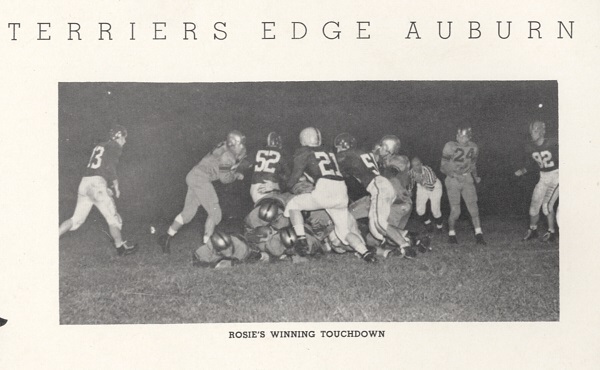 He lived in Spartanburg in retirement, and the archives has a small collection of his papers. He was the author of Chief Modern Poets of Britain and America, and Unified English Composition, among other works. He died in 1983. Here are a few of his poems. You can see other material that is part of our World War One At Home and Abroad exhibit in the Sandor Teszler Library Gallery this fall. 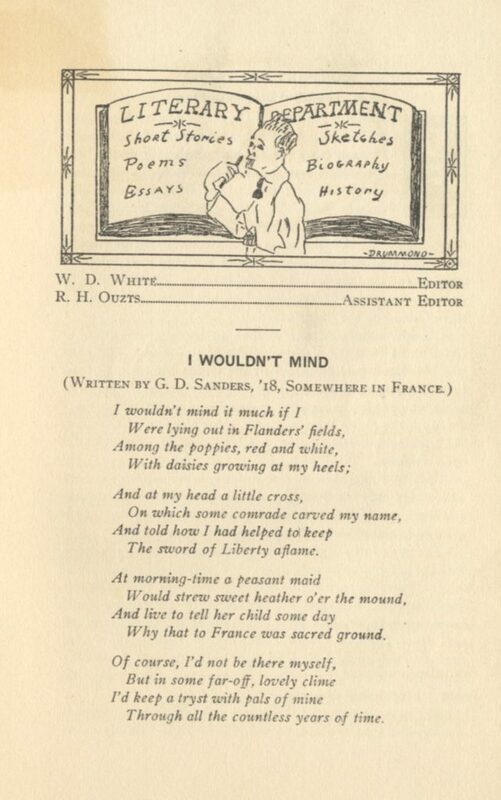 This fall, the Sandor Teszler Library has an exhibit on World War One at Home and Abroad in the library gallery. 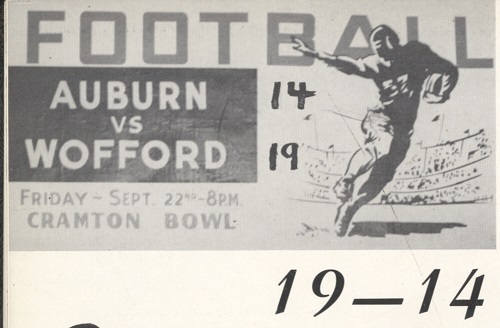 Most of the items in the exhibit come from the College’s Special Collections and Archives. The exhibit will be in our gallery until December, so if you are here for a football game or for Homecoming, please drop by and see what we have on display. 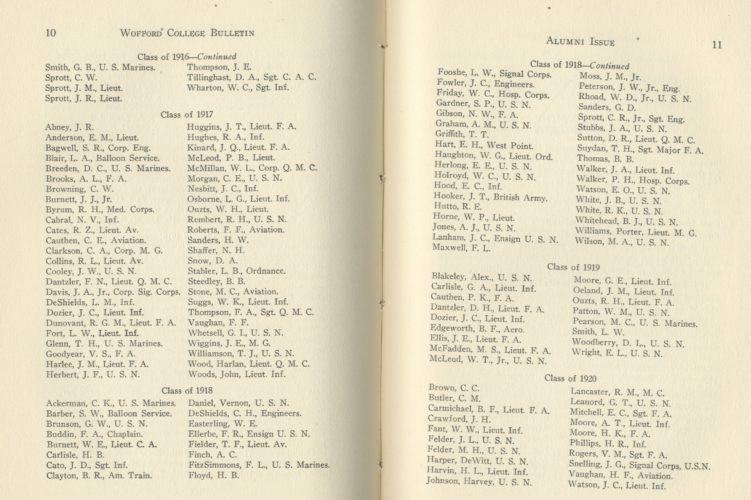 In addition to recognizing the 17 students and alumni who gave their lives in the war, one of the display cases has a list of all Wofford students and alumni who the college had recorded as serving in the war. The list came from a 1919 College Bulletin, and includes over 400 names. 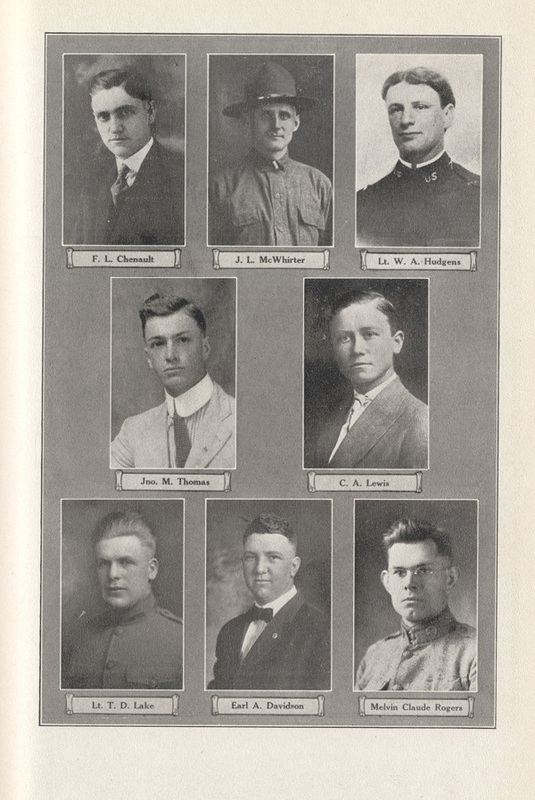 Considering that the college rarely had more than 400 students enrolled at any point before World War I, this is a substantial proportion of the college’s alums. Had American involvement in the war lasted longer than 19 months, this number would doubtless have been higher. 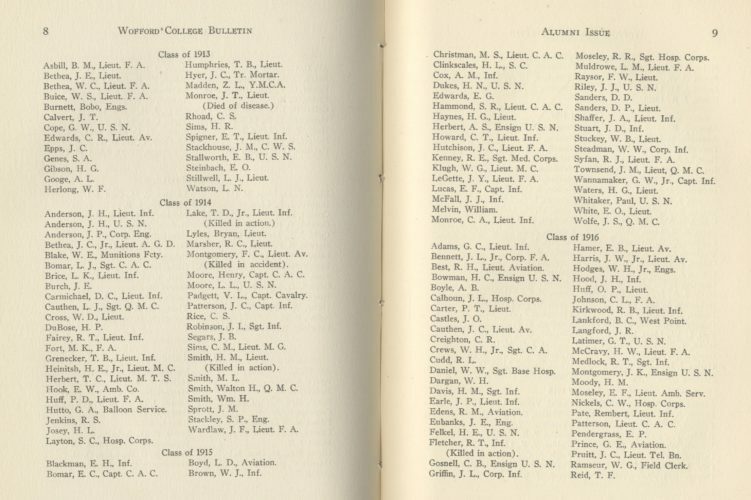 Below are copies of the pages indicating the names, arranged by class, of everyone who served in some capacity in the war. 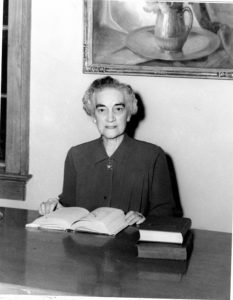 One of the South Carolina Conference’s many contributions to the Methodist Church’s mission work was Miss Louise Best, who served for some 37 years as an educator in Brazil. The daughter of Rev. Albert H. Best and Lillie Andrews Best, Louise Best grew up in a Methodist parsonage. She was born while her father was serving at Mars Bluff, and grew up in Clyde, Gourdine, Sumter, Greer, Campobello, Newberry, and McCormick, among other places. She attended Lander College (it was a Methodist college in those days) and Scarritt Bible and Training College in Kansas City. Scarritt was known for its work in training women for the mission field. Louise Best went to Brazil in the early 1920s, where she was sent, along with Miss Eunice Andrews, to help found a school in the city of Santa Maria, in the southernmost Brazilian state of Rio Grande do Sul. That part of Brazil was fairly remote, and was influenced by the Gaucho culture of Argentina. The school, Colegio Centenario, opened with 7 students in March 1922. They chose that name, which in English would be Centenary College, because 1922 was the centennial of Brazilian independence. The school was largely supported by the Women’s Society of Christian Service. It was originally a school for girls, and it started in a cottage. Over the next thirty years, it grew to include four large buildings, and encompassed a primary school, a high school, and junior college classes as well. For much of her time in Brazil, Louise Best was the principal of Colegio Centenario. Except for her first six months spent near Rio, Louise Best spent the entirety of her 37 years in the mission field in Santa Maria, Brazil. Some of her letters appeared on the Woman’s Society of Christian Service pages in The Advocate. Some of her letters speak of the vastness of Brazil’s countryside – it took 4 days by train to get to conferences in Rio. Other letters speak of construction projects – building the primary school, her hopes for a chapel – and of the support the mission had received from home. In later years, she wrote of the work that the college’s alumnae had undertaken to raise needed funds. As she neared retirement, the city of Santa Maria made her an honorary citizen, which was noted as a nice honor considering how the locals were a little suspicious of this Methodist mission in its early days. By the time she retired and returned to South Carolina, Miss Best noted, the school had as many Catholic as Protestant students. Following her retirement in 1958, she settled in Spartanburg, where one of her younger brothers lived. She spoke regularly in churches around the conference about her life and mission work. Part of her reason for speaking was no doubt to encourage others to enter the field, for as she told a reporter, “The need for missionaries far exceeds the number making applications and this is tragic.” She was attending a reunion of a handful of missionaries at the home of a minister in North Carolina when she died in July 1966.